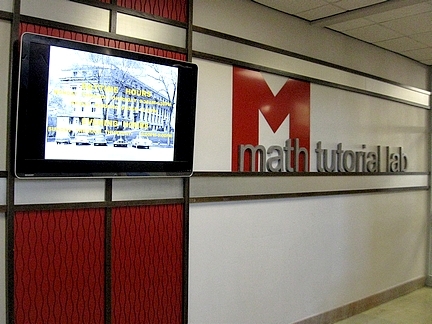 The Mathematics Tutorial Laboratory is a place for students to get assistance studying for their math classes. Its primary function is to provide students with the opportunity to receive one-on-one help from tutors ready and able to answer questions; the Math Tutorial Lab gets over 10,000 student visits each semester. The Math Lab is closed from 4:30 p.m. January 29 until 12:30 p.m. on January 31. Stay warm!! Monday -- Thursday: 9:30 a.m. to 4:30 p.m.
Sunday: 6:00 to 9:00 p.m.
Monday -- Thursday: 9:30 a.m. to 4:30 p.m. AND 6:00 to 9:00 p.m. NOTE: The Math Tutorial Lab will be closed Sunday, January 20 and Monday, January 21 in honor of Martin Luther King Day. The Math Tutorial Lab will be closed March 16 through March 24 for Spring Break. Please see the Spring 2019 Tutor Schedule to find out when your favorite tutor is working. Q: Who can come to the Math Lab? A: Students taking any of the courses listed here. Q: Who works at the Math Lab? A: Tutors are mathematics graduate teaching assistants and undergraduate math majors. Q: What else can you get at the Math Lab? A: The Math Tutorial Lab has 36 computers for you to use to complete your computer or online assignments. There are also reference sheets and practice exercises on a variety of topics covered in math courses. Q: Where can I find my TA? A: The Tutor Schedule shows who is working in the Math Tutorial Lab. The Mathematics Department Directory lists all instructors (faculty and TA's), their offices and their email addresses.